The task is designed for Pathway 2, Level 8 language learners. Students are to work in pairs to draft a conversation between friends comparing leisure activities and daily routines. Each pair is then to present their role play before their peers and teacher. 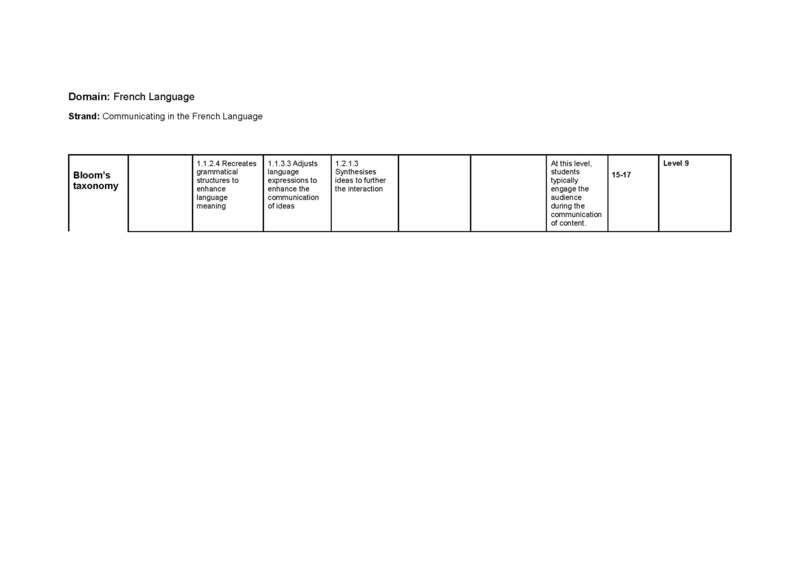 The task intends to assess students’ ability to present a dialogue in French. Purpose This presentation is a summative assessment of students’ knowledge of the unit on personal preferences,leisure activities and routines. The results will be used to inform students, their teacher and their parents of the students’ ZADs for this unit. The task was administered during Term 1 and was intended as a way for the teacher to build rapport with students and diagnose the scope of existing language skills and knowledge. Administer This assessment task was administered over the course of 3 French lessons. Students were allowed access to online dictionaries and workbooks during the drafting stage of the assessment task. To clarify student understanding, the teacher answered general questions about presentation format and content requirements. As a way of minimising the impact of noise in the data, the teacher allowed students time during the Wednesday, period 2 lesson in which to draft their presentations. Under these assessment conditions, the teacher was able to supervise students while they drafted their role plays and provide language assistance. To avoid student performance being affected by tiredness and distractions associated with period 6 lessons, the teacher chose to allow students time to draft their dialogue during period 2. Students were required to write their presentations during class time as a means of improving the authenticity of data. Students then presented their dialogue during the next lesson. Some students were absent, however, and had to perform their dialogue in the following week’s lesson. To ensure the accuracy of data, the teacher observed students drafting their dialogues and will assess students individually as they give their presentation aloud before the class. Video recording of role plays also allowed the teacher to review student presentations. Record Students’ marks were recorded in the teacher’s mark book. The teacher also recorded some targeted comments (e.g. regarding use of grammar, pronunciation) in the mark book. Ahead of allocating a final grade to student work, the teacher watched the recorded presentations to ensure validity and authenticity of marking. Interpret The teacher assessed both the written and spoken component of students’ presentations. The students received a percentage mark for the spoken component of their role play. Each group was then required to hand up a hard copy of their dialogue for correction. Use The results of the assessment task were used for the students’ reports, feedback to the students and their parents, and feedback to the teacher to inform future teaching. The results of this assessment task should be interpreted alongside other test scores and data to ensure that future teaching strategies are adequate and accurately pitched within students’ ZPD. Outstanding Students at this level possess confident and adaptable spoken communication skills. They synthesise their ideas and opinions to create fluent conversation, and adapt grammatical structures and vocabulary to enhance clarity of expression. They demonstrate understanding that the pronunciation of French words requires changing one’s accent, tone, and rhythm of speech. They also use non-verbal communication skills such as gesture to emphasise content. High Students at this level consistently apply grammatical rules and linguistic functions, which allow their ideas to be communicated as intended. They link ideas with transitional expressions and conjunctions. They use non-verbal communication functions to show their own understanding of spoken language. They are aware of differences in French pronunciation and attempt to replicate authentic French pronunciation. Medium Students at this level apply basic grammatical rules and conjugations. They demonstrate sound communication and understanding of French with verbal and non-verbal strategies. 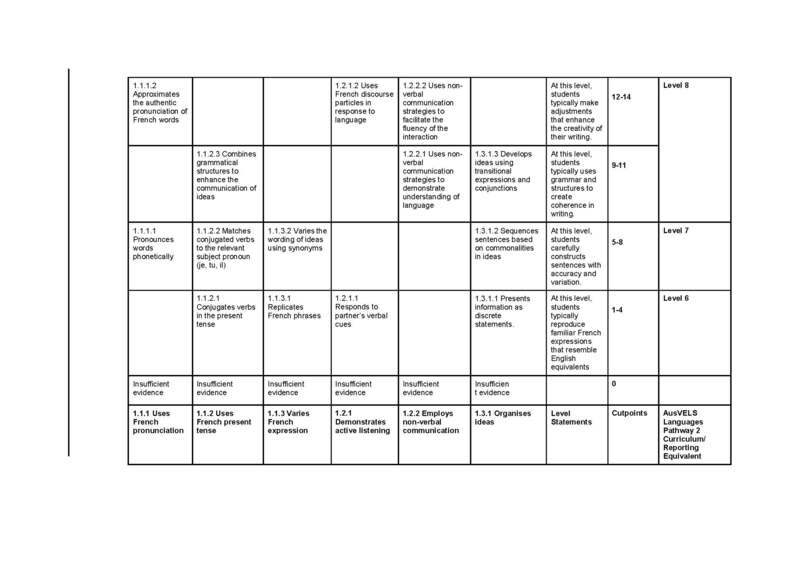 They sequence the order of their ideas based on thematic commonalities. They use synonyms to provide lexical variation. They pronounce words phonetically. Low Students at this level demonstrate basic spoken communication skills. They conjugate verbs in the present tense and replicate phrases that they have learnt, pronouncing their French either phonetically, or without adapting their accent to the context. They deliver content in discrete chunks and repeat familiar words and phrases.